Hamilton Beach Premiere Cookware Electric Griddle. A hot hearty breakfast is a meal that comes together quickly but it has to be served right away. 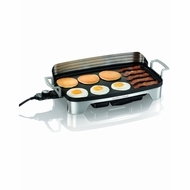 No worries - this Electric Griddle has a warming tray to keep food warm (more pancakes anyone?) until serving time.